Multi-touch functionality has been continuously attracting consumers attention for the last two years or so. We are now not too far from the day when multi-touch-capable tablets and desktops will become a standard part of our daily lives. The PC market is preparing for this paradigm shift, as Microsoft ships the much-awaited Windows 7 to the masses on October 22nd. Among many of its attractive features, the ability to use two (or more) fingers as input mechanism (multi-touch) in my opinion stands out for re-coursing the shape of personal computing in the near future. 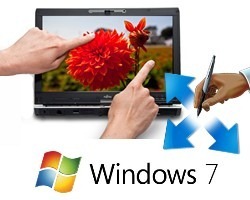 Windows Touch in Windows 7 with a multi-touch capable hardware allows for the use of two or more fingers to manipulate images or perform gestures on the screen. Users can increase or shrink the size of pictures on the screen by pinching or zooming and flip through documents and websites just like they can do on their iPhone.